There are plenty of Sprinter conversions around which take the bulletproof van base and give 16 seats. So why go the coachbuilt route? Mellor Coachcraft has been ambitious in the last couple of years, with a suite of products which include the Strata HF – a conventional, high-floor, wheelchair-accessible minibus. Like its lowfloor sister, the Strata LF, the Strata HF uses the 5.05-tonne Mercedes-Benz Sprinter chassis to produce a vehicle with a seating capacity of 16 or alternatively can carry up to seven wheelchairs while still retaining a minimum of two ordinary passenger seats. The new model utilises as far as possible the same components as the Strata LF and most importantly, coachbuilding the body has allowed the internal width to grow an extra 100mm, and that allows 2+2 seating to be fitted using 450mm wide individual seats. As with the Strata LF, the HF makes extensive use of new lightweight materials and the latest advanced CAD CAM design principles to produce a structure which is not only immensely strong and stable but also light in weight. The structure has been extensively whole-life tested at Millbrook and meets all required legislation. 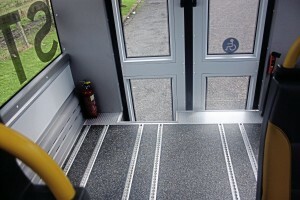 An underfloor-mounted cassette wheelchair lift is fitted. Two different lengths are available with both having the same seating/wheelchair capacities in standard vehicle format. One version uses the 3665mm, medium wheelbase chassis to produce a vehicle with an overall length of 6862mm. The other model uses the 4325mm, long wheelbase chassis to produce a vehicle with an overall length of 7760mm. Both vehicles are 2300mm wide and 2760mm high. 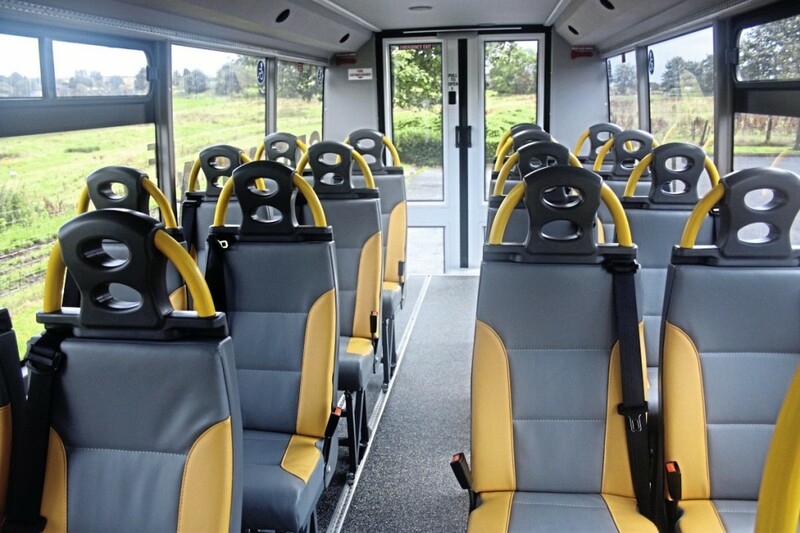 The long wheelbase version can be configured with a 5.5 tonnes GVW and this coupled with the large passenger area allows seating capacity to be raised to 19 or 22 passengers. The Sprinter is powered by the Mercedes 2.143-litre, four-cylinder, direct injection, turbocharged diesel engine to Euro 6 emission standards. Two powers are offered; 140bhp and 163bhp. Both engines have a wide power span and high maximum torque; 330Nm in the case of the 140 bhp engine and 360Nm in the case of the 163 bhp engine. In both cases the torque is available across a wide speed range. Two types of transmission are offered, the seven speed fully automatic or the six speed manual. Front suspension is the standard Mercedes-Benz independent system as used on all Sprinters together with variable ratio powered steering. Rear suspension utilises long elliptical leaf springs. The vehicle is available optionally with air suspension but this does carry weight penalties because the vehicle has to be equipped with an air system. The vehicle has disc brakes all round, a 75 litre fuel tank and a 18 litre Adblue tank. The side entrance is 675mm wide and is fitted with an inward opening, glazed, power door. When opened it reveals a three step entrance with flat, wide steps which are illuminated and have LED step edge lights. These give access to the main saloon floor, which is completely flat. The floor is covered in non-slip flooring and is fitted with seat tracking. Customers have a choice of seating styles but Mellor recommends the use of the lighter weight models produced by the various seat suppliers. Seats are track mounted and fitted with quick release fittings and again the customer can choose from a range of systems. Seating uses a 2+2 layout using 450mm individual seats. 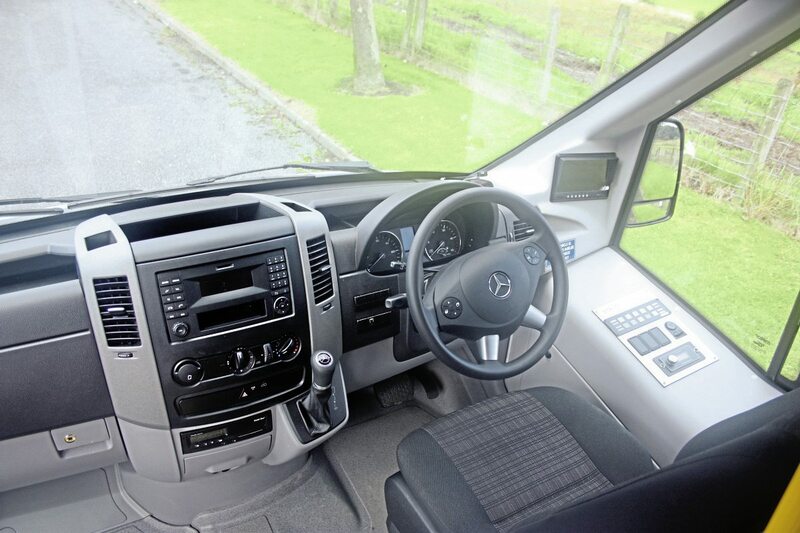 The front end sees the standard Mercedes-Benz Sprinter scuttle blended smoothly into a large sloping windscreen and large side windows that alongside the driver incorporates a manually operated signalling window. Saloon glazing is large, bonded, tinted units some incorporating sliding openable toplights. 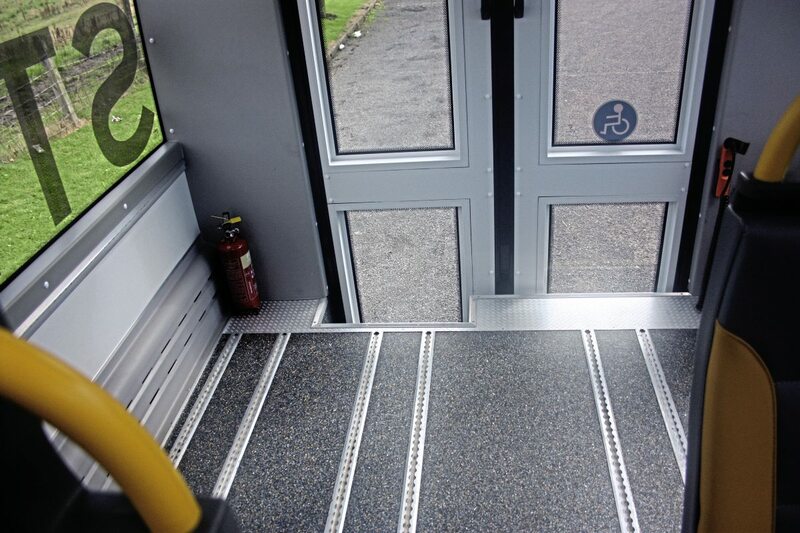 At the rear there are twin full-height glazed doors which open and fold back flat to the body giving an access space of 1275mm through which wheelchair passengers can be loaded. Again customers have a choice on in-board or external cassette style wheelchair lifts from a range of suppliers. Other features at the rear are special lighting and wheelchair clamping and seat belt equipment storage. Safety devices such as the PLS Door Safe safety barrier are available as options. Internal trimming is to the high standard we’ve come to expect from Mellor using fully-engineered, moulded units. Lighting uses full length LED systems throughout the length of the saloon and includes blue light night driving settings. Step edges are also illuminated. Heating and ventilation uses as standard a roof mounted climate controlled system with a choice of Eberspacher or Webasto units. Digital LED destination equipment is available as an option and as with the Strata LF this neatly contained at the top of the windscreen. The cab area is predominantly standard Mercedes-Benz Sprinter and there is nothing wrong with that because it is very good. Alongside the driver is a very neat push button panel for the body system controls. There is no driver door since the driver’s seat is easily accessed from within. The vehicle is fitted with a reversing camera, while a nearside bicycle alarm system and full CCTV are also available options. Alongside the driver there is a large luggage storage area. The result of all this attention to detail over the design of the interior of the vehicle is that it has a very light and airy feel and from the driver’s point of view it is an easy vehicle to manoeuvre and operate with extremely good vision. The vehicle is built to European Whole Vehicle Type Approval standard. The result is a nicely styled, well-built vehicle with maximum flexibility of layout to suit a wide range of operating requirements. Strata HF drives just as you would expect the latest Sprinter to drive. It has bags of power and torque and that is delivered smoothly and quietly. The transmission, in this case the seven-speed fully automatic, is excellent with well-matched steps and smooth, almost imperceptible changes. Ride and handling are excellent and the vehicle sits squarely on the road and is highly manoeuvrable giving a great feeling of security. Braking is powerful, smooth and straight. The quality of the body design and build means that there are no squeaks or rattles and there is no shimmer or sway. Within the saloon the vehicle is light and airy and the ambience is comfortable. Vision through the large windows is very good and the ride is smooth. The Strata HF is a really well designed addition to the Mellor range of products. 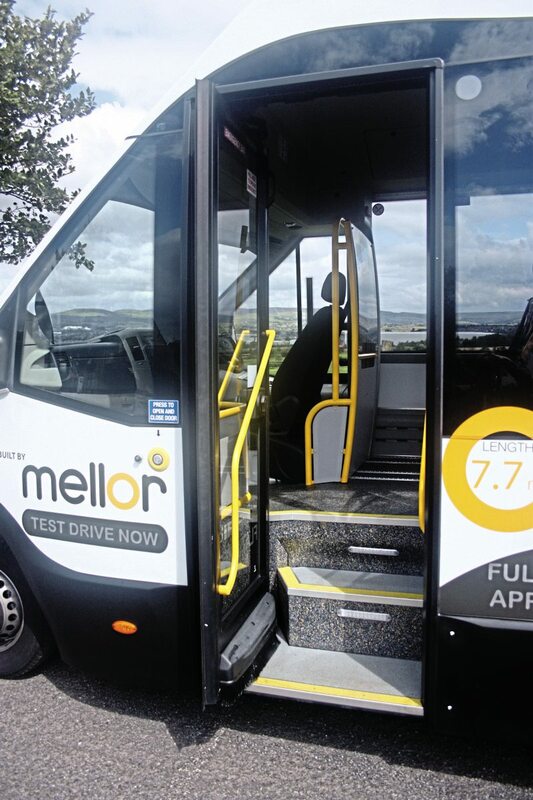 Mellor has seen a remarkable rise in its standing as being a major producer of wheelchair-accessible coachbuilt minibuses over the past couple of years. It all stems from the takeover of the parent company Woodall Nicolson by a group of like-minded investors with a particular interest in the automotive sector. The group is led by Chairman Brian Davidson, who subsequently purchased the tooling and the Intellectual Property Rights of Bluebird Vehicles. 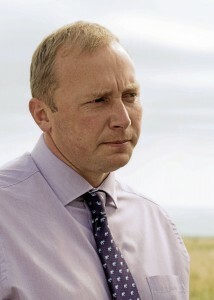 Brian’s influence has an immediate impact across the Group; in particular Mellor’s cramped production base at Rochdale was re-planned to achieve more efficient production but probably the most valuable acquisition was John Randerson, who had a significant role in the design of Bluebird’s market-leading models the Orion and Tucana. John is passionate about using the most advanced computer-aided design (CAD) principles to produce vehicles which achieve the correct design solution but achieve it in the most cost-effective way by using the latest techniques and materials without compromising on strength but maximising weight reduction. He is also passionate about ensuring that all the ‘Mellor’ components are fully engineered and repeatable. This is often difficult to achieve with coachbuilt vehicles, because as basic designs are tweaked or altered to suit particular customer requirements you end up with components that are one-offs and difficult to repeat. John doesn’t want to lose that flexibility to meet customer’s requirements but believes it has to be controlled which is why he insists that all components fitted are fully engineered. By introducing these principles John has been able to achieve a raft of upgraded or new products and achieve vehicles which can be built more quickly and to a consistently high quality standard and with good aftermarket availability. 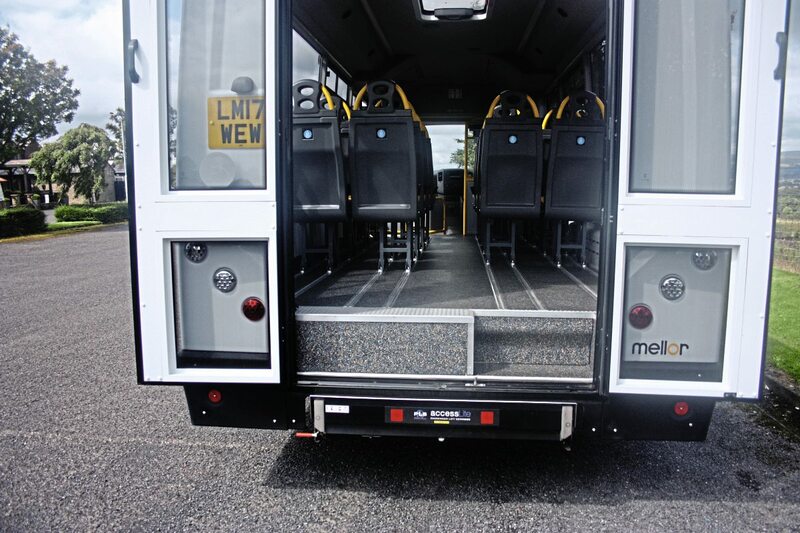 It all started with upgrading the popular Orion lowfloor, wheelchair-accessible minibus which can provide direct wheelchair access through the side entrance or assisted wheelchair access through the rear doors. It is produced in both conventional accessible vehicle form or increasingly in service bus form. The re-engineered Orion was quickly followed by the Maxima, a high-capacity (33 seats) high-floor, wheelchair-accessible vehicle using the Iveco New Daily 7.5 tonne chassis fitted with the outstanding ZF-derived, eight-speed Hi-Matic fully automatic transmission. Initial sales have proven very satisfactory. Next was the Strata LF. This took the popular Mercedes-Benz Sprinter 5.5 tonnes chassis and built on it a directly wheelchair-accessible body with a completely flat, low floor at the front of the saloon and then a step up onto a raised section fitted with fixed seats. Care in the design and use of materials meant that Mellor can achieve 2+2 seating in this part of the saloon using 450mm wide seats. The Strata LF has proved very popular not only with Mellor’s traditional customers but increasingly by mainstream stage carriage operators who are beginning to see the advantages of using a properly designed and engineered small buses for certain routes because of their flexibility, low maintenance costs, cost effective initial cost, high residuals and fuel economy. Close on the Strata LFs heels was the Tucana 2; a completely re-engineered version of the popular 15-seat minibus built on the new VW Transporter T6 chassis. Again the vehicle provides a completely flat-floored vehicle with direct wheelchair accessibility through the side entrance or can have conventional, assisted wheelchair access through the rear doors. Again a service bus version is an option. 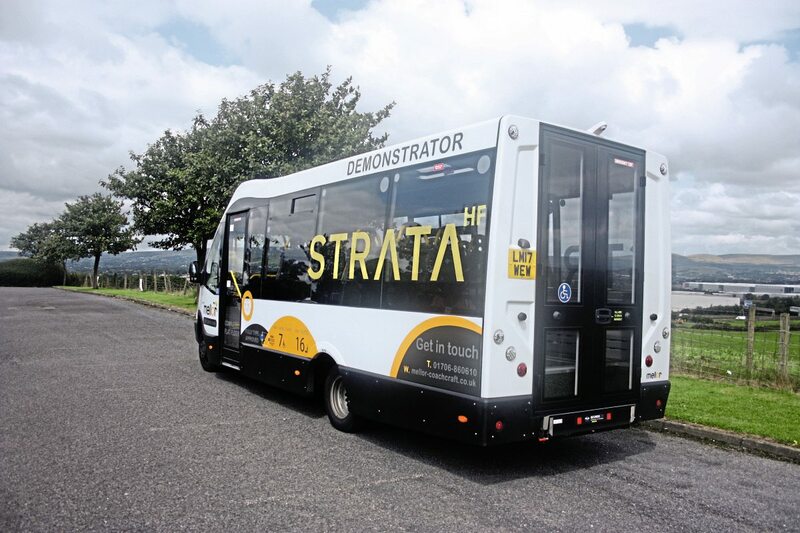 Now we have the new Strata HF to round off the new range of quite innovative vehicles. We also must not forget that Mellor has also developed an all-electric version of the Orion. The Orion E is the first fully-electric small bus available in the UK. John is passionate about getting the message out that small buses can live with the rigours of commercial stage carriage operation and can make real cost savings for operators provided they are used in the right way. 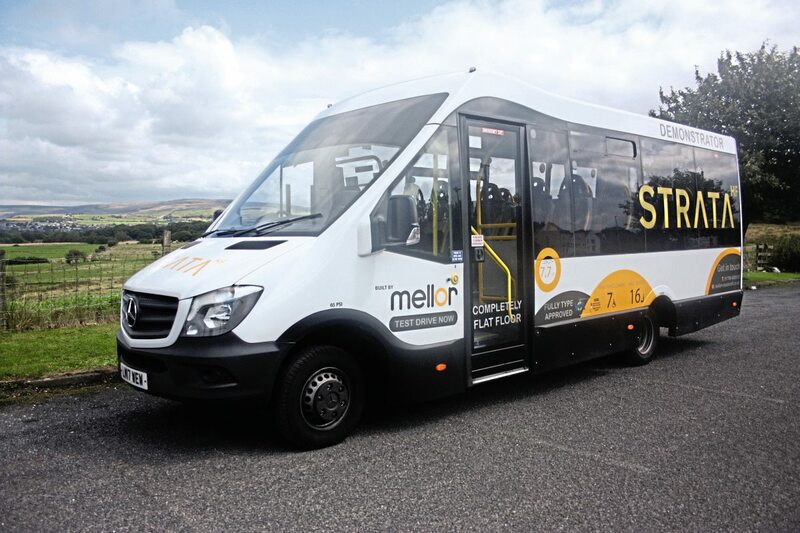 The message is getting through because Mellor has seen more and more operators including the big groups dipping their toes in the water and in some cases already coming back for more. I must stress that Mellor continue to offer their previous what I will call ‘conventional’ coachbuilt accessible vehicles and will do so while demand continues. The new approach has taken a lot of courage and investment to carry out in a remarkably quick time but already the results are showing that it was a right decision. Sales up, production at its highest ever level and new customers. But there is more with demand now coming from Europe and even Australia. Recently Mellor have appointed a number of European dealers and appeared at the Busworld exhibition in Belgium (see page 14 onwards) showing off Orion E and Strata LF. Mellor is definitely on the move in the right direction.